How to Get our NEW iPad App -- and Other FAQ! A: No, you do not need to delete the old version. If you have automatic updates on, it will update automatically. If not, you can update it on your own. To do so, tap on the Google Play Store icon, then tap on "My Apps," find the NBC Washington icon and tap "Update." You can also go to the Google Play Store and search for the NBC Washington app and tap "Update." A: On your iPad, tap on your App Store icon, then tap on Updates and find the NBC Washington icon and tap "Update.” You can also go to the App Store and search for the NBC Washington app and tap "Update." On your Android device, tap on the Google Play Store icon, then tap on "My Apps," find the NBC Washington icon and tap "Update." You can also go to the Google Play Store and search for the NBC Washington app and tap "Update." Q: In the App Store, I used to see two different versions of the NBC Washington app, one for iPhone and one for iPad. Now I only see one. Why is that? A: You can customize the start screen of our app to highlight news OR weather when you open it. If weather information is crucial for you and your family, we want you to see it immediately on the app to make your life easier. If you’re more interested in local and national news, you can continue to see that first when the app opens if you want. To make a change, tap on the main nav icon in the upper left and then tap on “Set Your Start Screen” to choose between Top Stories or Weather. Q: When I open my Storm Team4 app, I get a message telling me to download the NBC Washington news app instead. What’s up with that? 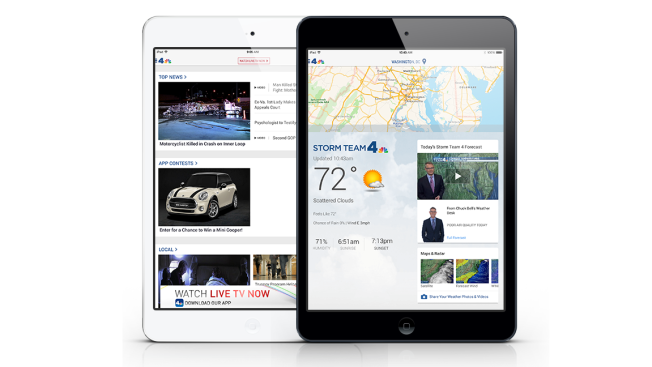 A: We are combining our Storm Team4 app and News app into one powerful local news and weather app. All of the information found in the Storm Team4 app has been added to our News app, as well as some other key enhancements we hope you like. This is just the first step in improving our overall app weather content. Stay tuned for even more features in future updates. Q: What happens if I don’t download the new station app and continue to use the current Storm Team4 app? A: Sorry, but our current Storm Team4 app will eventually suffer the same fate as black-and-white TV sets. At some point in the near future the Storm Team4 app will stop working altogether. But we’re putting all the great weather functionality you expect in the station app. We believe you’ll like the improvements to our weather section in the station app, and appreciate having all of your news and weather in one place.